Regeneration of Tuart (Eucalyptus gomphocephala), in many parts of its fragmented distribution in Western Australia, is nominal. Previous work has shown it has specific regeneration niche requirements, recruiting in ashbeds within canopy gaps. We conducted a field trial to determine whether regeneration could be facilitated by creating coarse woody debris (CWD) piles that would become ashbeds during a low-intensity, prescribed burn. Regeneration experiment. Paganoni Swamp Bushland, a peri-urban Eucalyptus-Banksia woodland, was due for prescribed burning in 2011. Prior to the burn, twelve canopy gaps within the bushland were chosen to have CWD piles built up in the centre (5mx5m wide, 0.5m height). Six gaps were chosen to have no ashbeds, and so had any naturally occurring CDW removed. Adjacent to each plot (whether ashbed or no ashbed), an extra 5mx5m plot was marked out as a control. The six gaps without ashbeds, and half of the 12 ashbeds, were broadcast with Tuart seed in plots of 5m x 5m following the prescribed burn. Approximately 375 seeds/per 25m2 plot (after typical forestry seeding practice) were sown within one month of the prescribed burn. The temperature of the control burn that moved through the area was measured in the gaps using pyrocrayons. 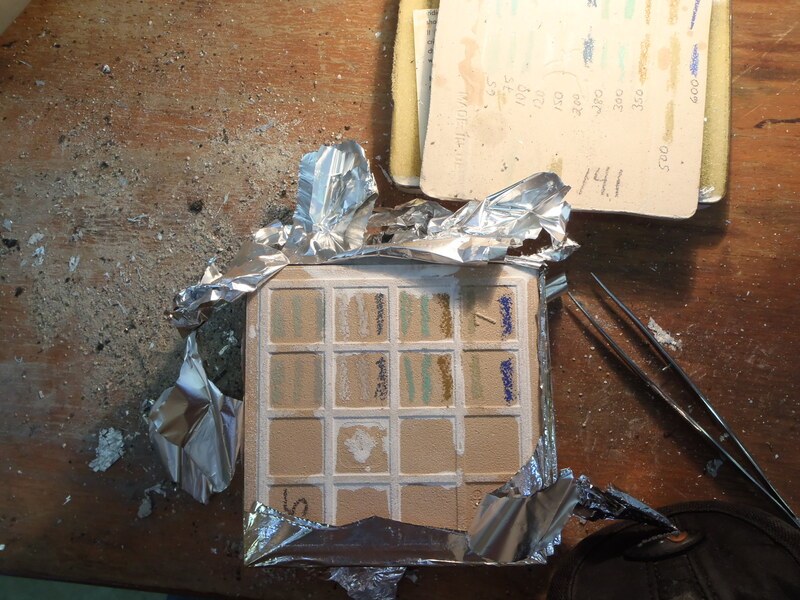 These temperature-sensitive crayons were used to draw lines onto ceramic tiles. Five tiles were placed into each gap, either on the surface in the non-ashbed plots, or beneath the CWD piles, totaling 90 tiles. Results. 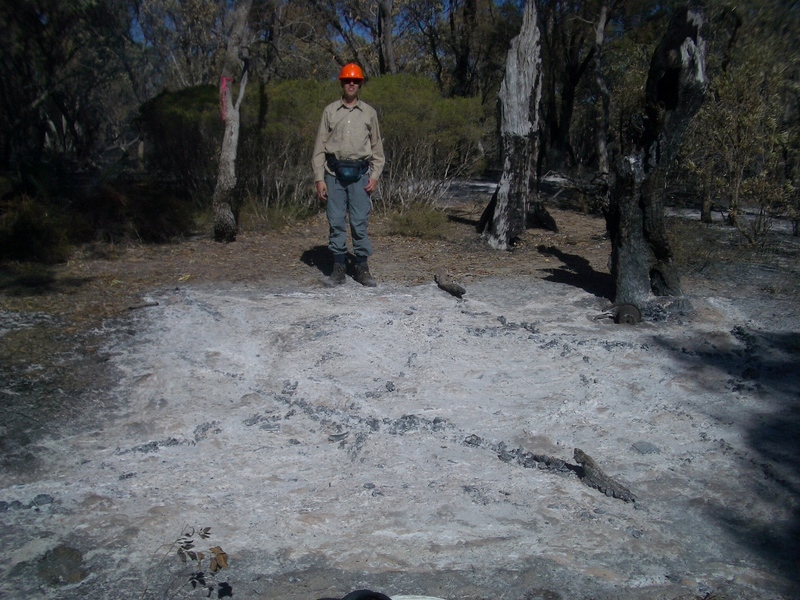 The majority of CDW piles burnt during the prescribed burning activities. These piles burnt at high temperatures (~560Co) compared with the control plots (~70 Co). After six months, the ashbeds, especially those that were seeded, contained a significantly higher number of seedlings (0.7/m2 ± 0.3) than ashbeds without added seed (0.01/m2 ± 0.01) or control plots (0.0-0.05/m2 ± 0.0-0.05). Lessons learned. 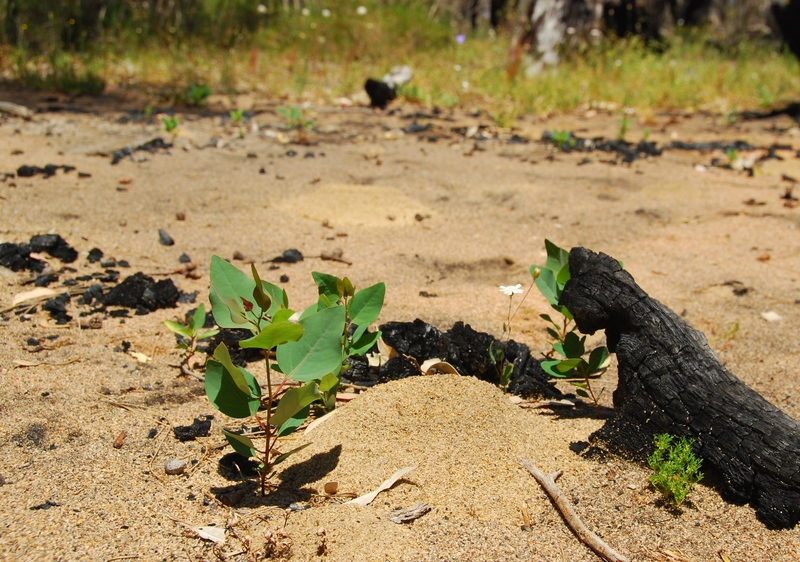 Tuart regeneration can be facilitated at an operational scale as part of prescribed fire activities, through creation of CWD piles and broadcast seeding. However, higher rates of seeding could be used. Raking the seeds following broadcasting to reduce removal by seed predators may also increase seedling numbers. Acknowledgements. Thanks go to the State Centre of Excellence for Climate Change, Woodland and Forest Health, Murdoch University; Western Australian Department of Environment and Conservation; and to Friends of Paganoni Swamp. Tuart seedlings recruiting following ashbed creation and broadcast seeding. Note that this is the same ashbed as in Figure 2. 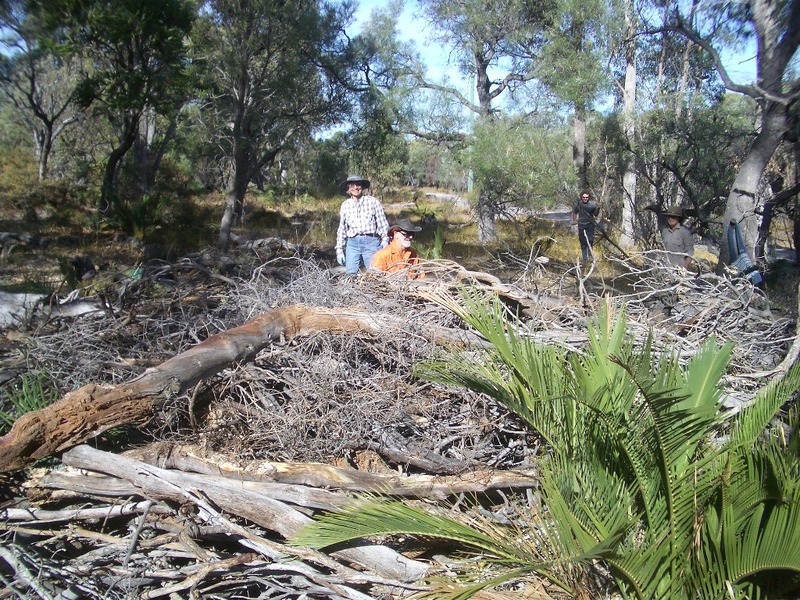 This entry was posted in Fire Ecology & Management, reconstruction, Restoration & management theory, Sclerophyll communities, Techniques & methodology, Western Australia. Bookmark the permalink.